Video game titles for kids and teens, like "Marvel: Super Hero Squad," are easy to find with the right resources. This year's games range from real-action sports to video versions of classics like "Clue"
Editor's note: Scott Steinberg is the head of technology and video game consulting firm TechSavvy Global, as well as the founder of GameExec magazine and Game Industry TV. The creator and host of online video series Game Theory, he frequently appears as an on-air technology analyst for CNN, ABC, CBS, NBC, and Fox. (CNN) -- With controversial adult titles like "Call of Duty: Black Ops" and "Medal of Honor" so often hogging headlines, a truth of the industry bears repeating -- most video games are still for kids. More than 82 percent of all digital diversions released last year were perfectly safe for kids and teens, according to the Entertainment Software Association. Parents shopping for children this holiday season needn't have trouble picking an age-appropriate gift, with many great shopping resources at their disposal. The Entertainment Software Rating Board (ESRB) places clear motion-picture style ratings on the front of every retail box, along with descriptions of any questionable content. It's also now offering a free iPod and iPhone Touch app so you can retrieve information on demand right at your local store. Websites such as FamilyFriendlyVideoGames.com, WhatTheyPlay.com and Common Sense Media also provide helpful tips on choosing top titles, setting guidelines and promoting healthy gaming habits. Be sure to check all for buying advice, and see online review sites like GameSpot and IGN.com for tips on which titles are actually worth the investment. But by far the best way to pick a great game for your children is to get involved with their gaming habits and even hoist a controller yourself. You won't just enjoy the pleasure of spending quality time with kids and get to know their interests better. You'll also better familiarize yourself with features of their gaming systems -- including tools like parental controls for the PlayStation 3, Xbox 360 and Wii. Remember that the definition of "family-friendly" may vary from household to household. After all, titles like the somewhat more mature "Epic Mickey" and "Need for Speed: Hot Pursuit" can sport similar ratings to "Yogi Bear" and "LEGO Harry Potter: Years 1-4." As G.I. Joe says, knowing is half the battle. Games like "Pictionary," "PokePark: Pikachu's Adventure," "Tangled: The Video Game," and "Learn Science" are among the high-tech options designed to entertain kids of all ages this year. Here are five titles to help get your holiday wish list started, each of which young ones should enjoy. 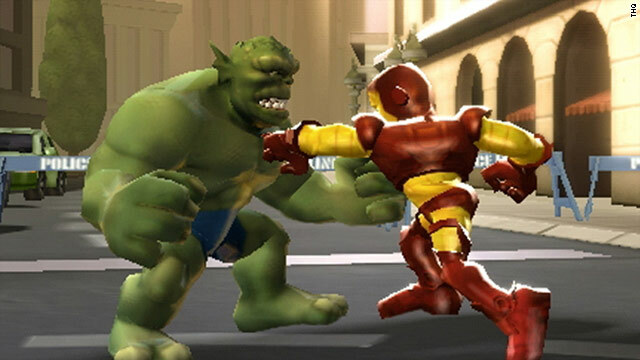 Marvel Super Hero Squad: The Infinity Gauntlet (THQ, DS/PlayStation 3/Xbox 360/Wii) -- Kid-friendly versions of Spider-Man, Iron Man and The Hulk team up, as can Doctor Doom, Magneto and other comic book villains, in a tongue-in-cheek action-adventure for up to four players. Solving puzzles, socking it to enemies and unleashing a host of colorful superpowers rank among top activities. Wii Party (Nintendo, Wii) -- An interactive board game boasting dozens of motion-sensing mini-games that send you frantically racing to grab remotes, swap controllers or balance atop teetering platforms. It's an active challenge the whole family will enjoy, and much easier to clean up after than "Monopoly" or "Scrabble." Kinect Sports (Microsoft, Xbox 360) -- Using only their bodies and Microsoft's hands-free Kinect accessory, kids can go bowling, play table tennis or enjoy rounds of soccer. This game encourages the sprouts to get up off the couch and get active. Just be careful to clear the living room before firing it up, lest your treasured vase or flower pot become collateral damage. Dance Dance Revolution (Konami, PlayStation 3/Wii) -- Newly updated for the Wii, and with added support for Sony's motion-sensing PlayStation Move controller, the world's most popular dancing simulation remains a hip-shaking favorite. Wiggling and grooving, kids can work off steam to tunes by Jason Mraz and Lady Gaga, choreograph dance routines on the Wii and record and share performances on video with the PS3. This gives tabletop classics a 21st century twist, letting you enjoy solo or online multiplayer matches of childhood favorites including "Clue," "Mouse Trap" and "Twister." Also featuring "Yahtzee: Hands Down" and "The Game of Life," it'll appeal to both little and big kids -- even the grown ones.